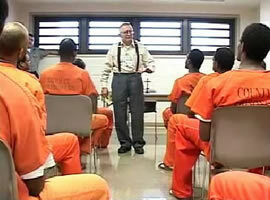 The Diocesan Ministry to the Incarcerated serves many institutions at the county, state and federal level. We focus mainly on facilities within our eight county diocesan area, but through our incarcerated parishioners and their families we touch a much wider area. Driven by the Gospel message to visit and care for the imprisoned, comfort the sorrowful and help the low in spirit. We accomplish this through several simple programs tailored to meet the needs of the incarcerated. In all we have over 400 volunteers serving in prison ministry and yet the need outstrips our resources. With hundreds of active lay volunteers, nuns, priests and deacons the need still outstrips our resources. We serve in all the prisons and jails in the Diocese of Cleveland, although the number of volunteers and the programs offered may vary greatly from facility to facility. Some facilities are “adopted” by one or more parishes and they service the needs of that facility. You need not belong to a particular parish to volunteer at a particular facility or group. If the Holy Spirit is tugging at your heart and you would like to volunteer, there are many opportunities to help within a wide range of time commitments. Go to our volunteer page for more information.